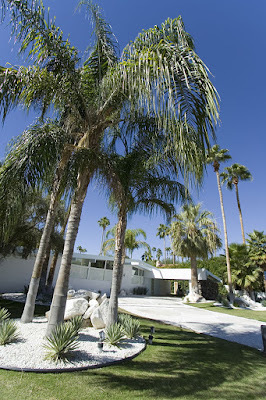 Architect Albert Frey made his mark on many Palm Springs area buildings. It was his work with corrugated aluminum that helped to make him so well known. 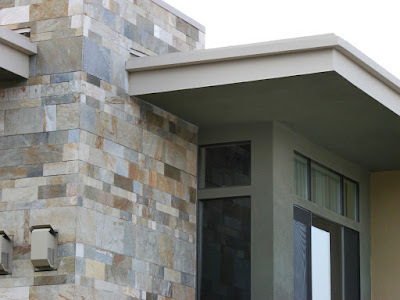 Notice the corrugated aluminum that make up the eaves of this building. Cool stuff. 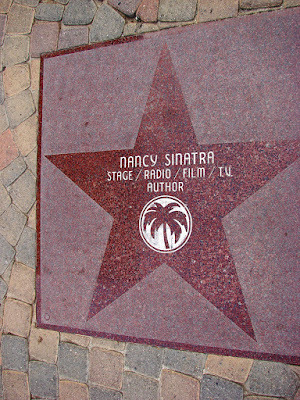 Another star from the Palm Springs Walk of Stars our famous Hollywood imitation of embedding metal stars along the sidewalk. This one's for you, Nancy. 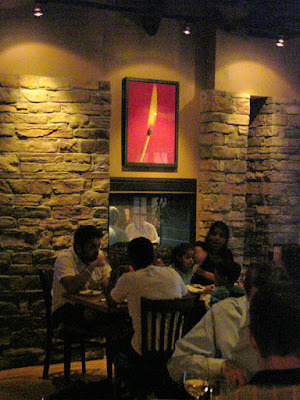 The walls of the Red Tomato restaurant in Cathedral City take patrons back to the turn of the last century. Slides are posted inside light boxes that are hung on the walls around the restaurant. They're so fun to look at! 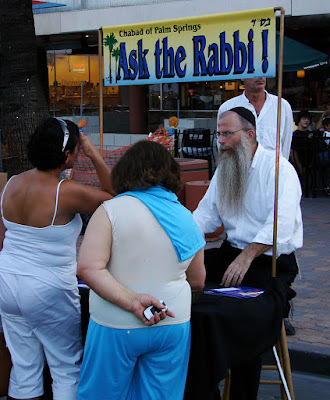 The "rabbi" has had a small booth at the Palm Springs Village Fest for years. Great place for a little spiritual help, Jewish style. You guys up north get slammed in winter, but we down in the desert get slammed in summer. I'm talking about power bills. See the cute little electrical sub-station in the picture above. That gives me my power. 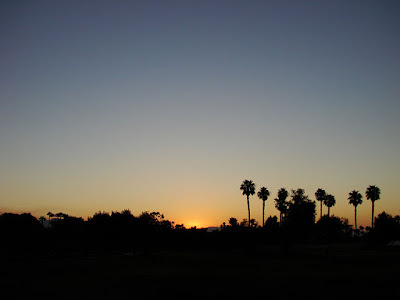 It's part of the Southern California Edison Company's power grid. Last month (July/Aug), the month of the year when I use the most electricity, I used 3,012 kilowatt hours. Geeze, it cost me $498.90. Yikes! 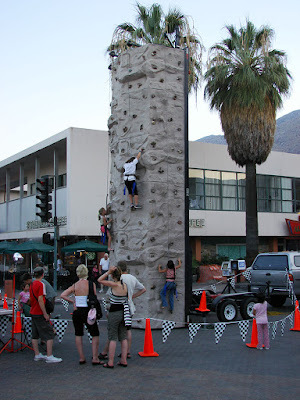 Climbing wall at Village Fest. Kids love it. Every Thursday night. 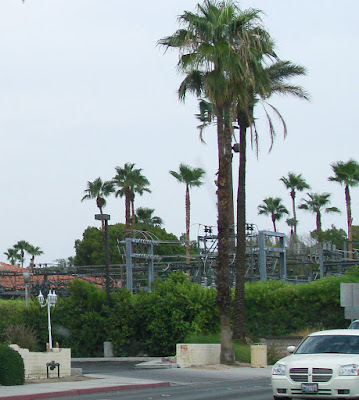 Yes, queen palms do grow in the desert~! A couple of posts back, I showed an image of a Ray Charles toy from a vender at the street fair (Palm Springs Village Fest). 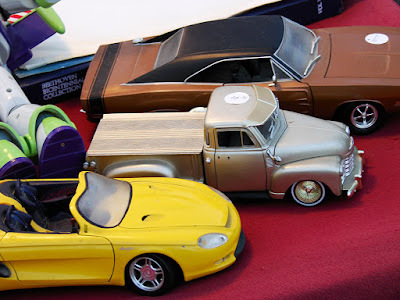 Today I uploaded an image of some toy cars from the same vender, my favorite at Village Fest. 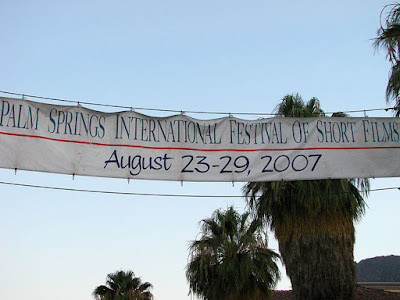 Coming soon--the Palm Springs International Festival of Short Films. 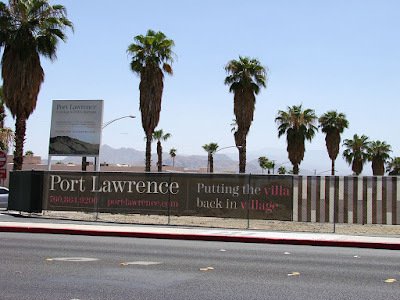 As the summer turns more sticky in Palm Springs (we have a light monsoon season); heads are turning to Port Lawrence, an upscale loft development, which was supposed to be completed this fall. Last year the city and developers excused over a dozen tenants from running their businesses in the area so that the classic mid-century modern buildings could be demolished to make room for a new upscale condo development. 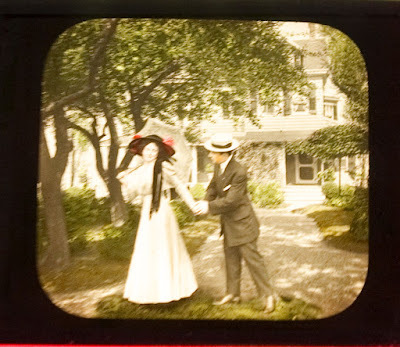 The part of town was a busy, new, thriving arts district with galleries, restaurants and gift shops, all of which were destroyed quickly, leaving a barren almost-dozen block area just north of downtown a vast empty lot surrounded by a fence with a pretty sign that advertises Port Lawrence. The vacant area has great piles of dirt and concrete rubble--not pretty. Other rumors have it that the city wants detailed plans of the entire development before its built. Pity that our downtown is being held up. Feel free to comment. 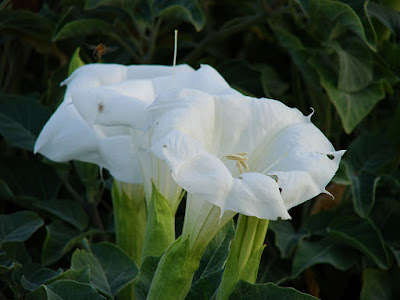 You can find these in the undeveloped areas of Palm Springs growing wild and filled with bees. When Palm Springs went retro in the late 1990s (people rediscovered the mid-century modern style architecture here); the Polynesian god Tiki came along. He added life to the sometimes sparse minimalism (clean lines, floor to ceiling glass and interiors free of ornamentation) that was a characteristic of the mid-century modern properties that people went on to buy and remodel. 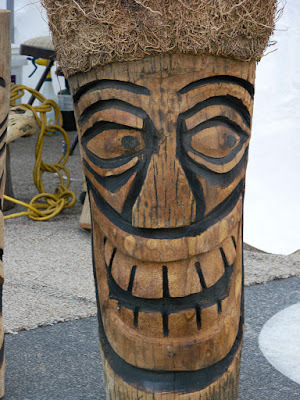 This Tiki probably will make it to one of those homes of minimalism. 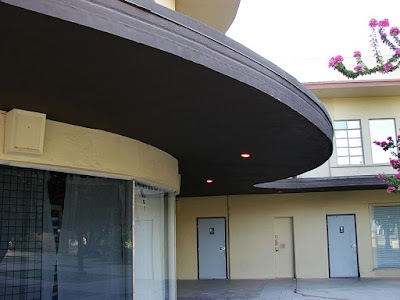 There's a bar called Zelda's in Palm Springs that's housed in some pretty classic mid-century modern architecture. To get there you travel north on Indian from Ramon and go till you see the Zelda's sign on your left (Indian is one way going north). Park in the Zelda's lot or along the street during the day and you'll be enchanted with a walk that will take you back to the 50s. 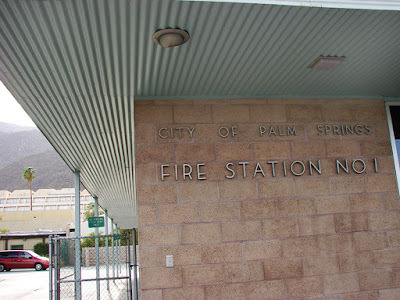 Palm Springs is a peculiar place in that it has a strict preservation code to save mid-century modern architecture from the wrecking ball. In most other cities sites like this are abandoned highway monuments that people never know what to do with. Here's Palm Springs definition of an historic site that's worth preserving. 7. That has yielded or may likely to yield information important to national, state or local history or prehistory. 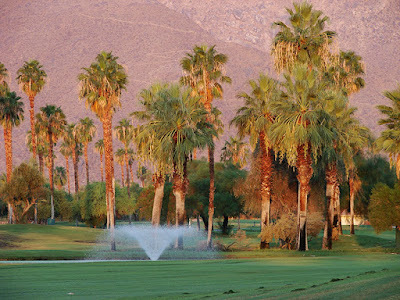 Courtesy of the Palm Springs Preservation Foundation. 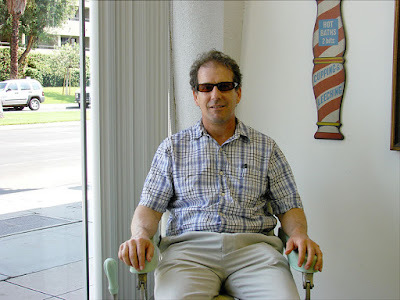 That would be me sitting in the barber chair that was yesterday's daily photo. 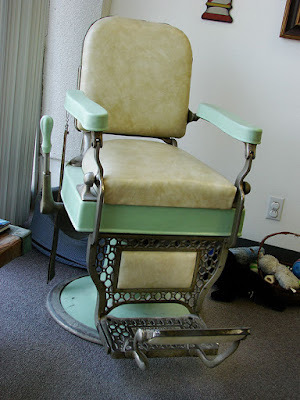 This is a barbershop chair from the 1920s at a hair salon on Tahquitz near downtown. It's a Jewish deli. 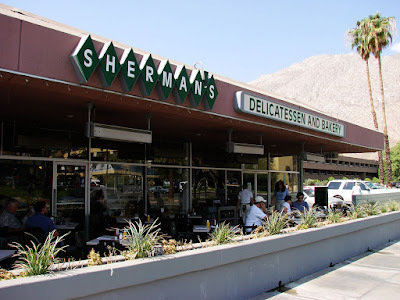 Palm Springs has two Jewish-type delis. The other is Manhattan. 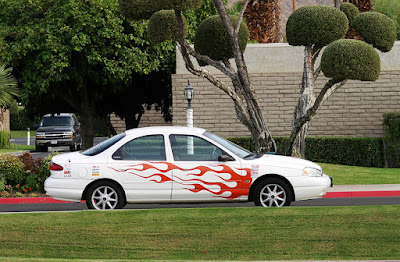 Palm Springs always gets some really weird stuff. Some people call them collectables. I used to collect stuff till I couldn't move in my house anymore (I used to collect wild-colored Samsonite luggage among other things). Now I just collect my photographs on my computer (I have 3 external hard-drives filled with them). 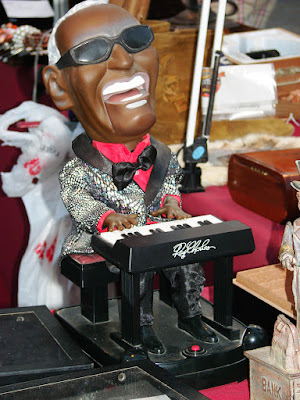 This is a Ray Charles ornament that was for sale at the collectables vendor at the Thursday night street fair. It's battery operated and his head moves back and forth. He was a crowd-stopper. 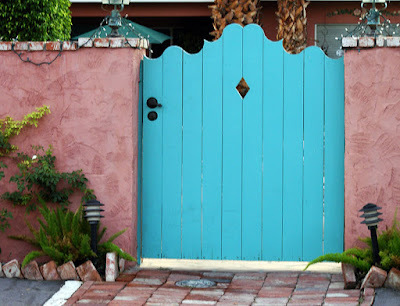 Nice color combos in the south end of Palm Springs. 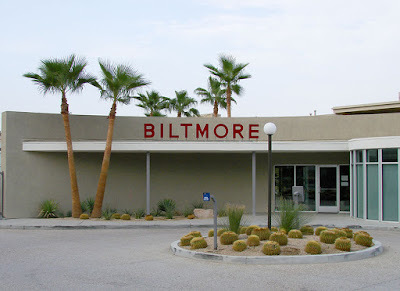 Here's the front of the Biltmore Colony, the condo development that I wrote about yesterday. Ahhh, another new condo development. This is the new Biltmore Colony, a condo development derived from the old Biltmore Hotel. Well, here's an inside look at a trendy Palm Springs venue--the Matchbox restaurant. Personally, I think it's the best restaurant in the city, not just because their main dish is an upscale pizza (I love pizza); but because the atmosphere and other more substantial dishes remind me of what you get in San Francisco. Aside from that, when the Miss Teen USA beauty pageant comes here in summer, they eat there. If it's good enough for beauty queens it's good enough for me. 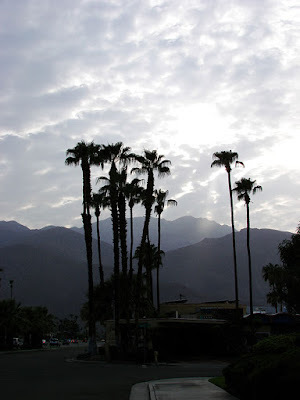 This was Palm Springs yesterday; pretty picture, but, alas, to be in the sultry air gets a bit tiring. The temperture was in the 90s and the humidity around 60 percent. Still not as bad as, say, Miami.